One of the most common pieces of moving advice out there is to clear out your home before you begin packing. By getting rid of old, unwanted items (especially if their weight is greater than their value), you can not o nly enjoy an easier move, but a less expensive one. In fact, if money is a concern, donating your household goods is also a great way to take advantage of tax breaks. By choosing the right organization, you can feel good about giving back to the community, streamline your moving process, and save money in the bargain. Here are the best places to consider for donation. The Salvation Army is a Christian-based organization. Other thrift stores might have ties to your community, church groups, or local veterans. Remember, too, that if you want the tax deduction for you donation, the organization will need to be a government-recognized nonprofit. You can also look for great features like pickup services, which will load up your donations from your own front porch. Some of the greatest community needs exist in homeless shelters and shelters for women and children. Although they rarely require large-ticket items like couches or bookshelves, personal items are always in need. Blankets, clothing, toiletries, books, toys (for kids), office supplies, and other items are gratefully accepted. However, you should always call ahead to ensure your donation meets their requirements, as they may have restrictions on used or large items. Cleaning out the kitchen cupboards is just as important as clearing your closet shelves. If you have non-perishable food items that haven’t yet reached their expiration date, consider boxing them up and taking them to a local food bank. Moving food is rarely cost-effective, and chances are you can’t eat all that bulk pasta before you go, so why not give it to those who will appreciate it? If the items you want to unload aren’t boxes of clothes but piles of wood, construction items, and other unused DIY items, consider donating them to Habitat for Humanity. 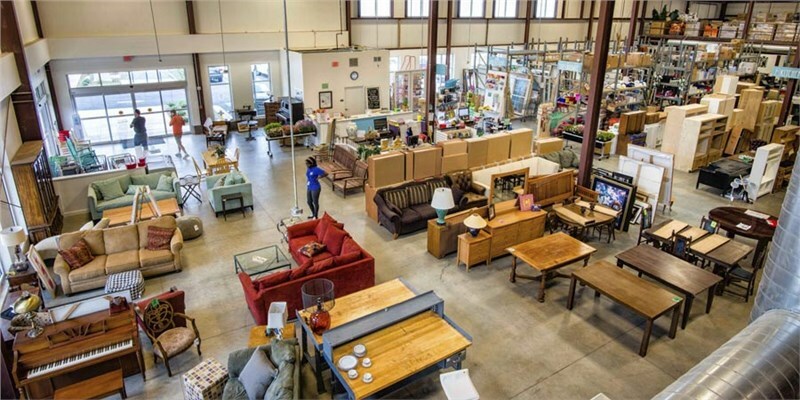 Their ReStore project is a series of home improvement and furniture stores that offer new and gently used renovation materials. Proceeds go to help build new homes for families in need.